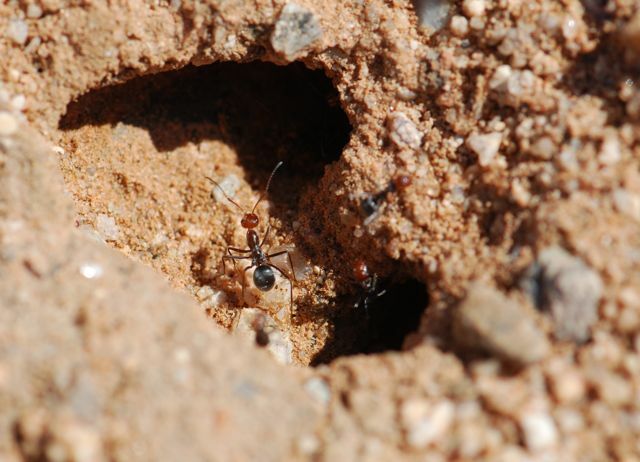 The challenge: to see how many species of ants I could find in Tucson, Arizona in two hours. In addition to the usual suspects, Tuscon has quite a few interesting species. What are those peeking out of a hole? 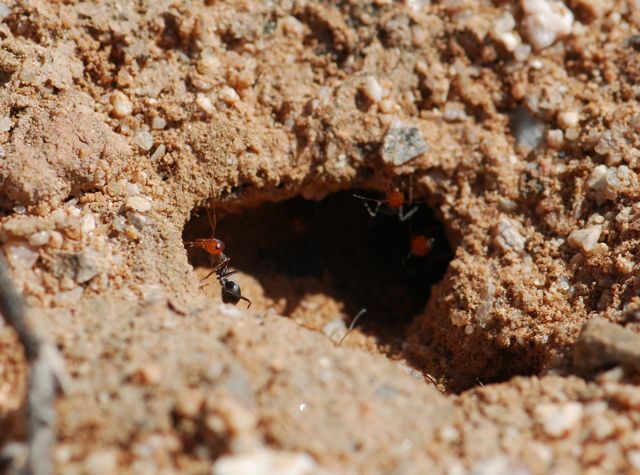 Taking a closer look, I found worker ants with black bodies, red heads and long antennae. The workers were milling about at the nest entrance, aware of my presence. 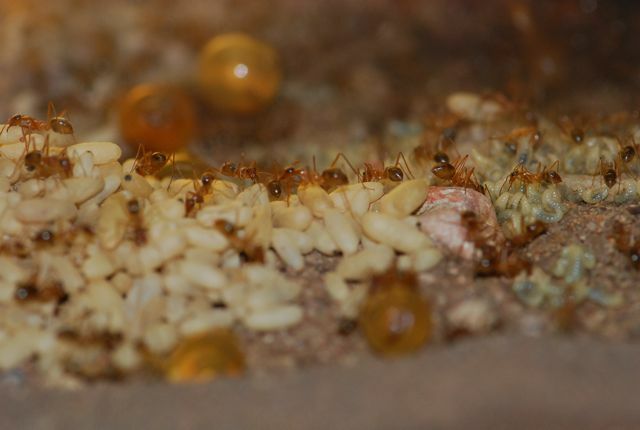 These are Myrmecocystus placodops, a type of honeypot ant. 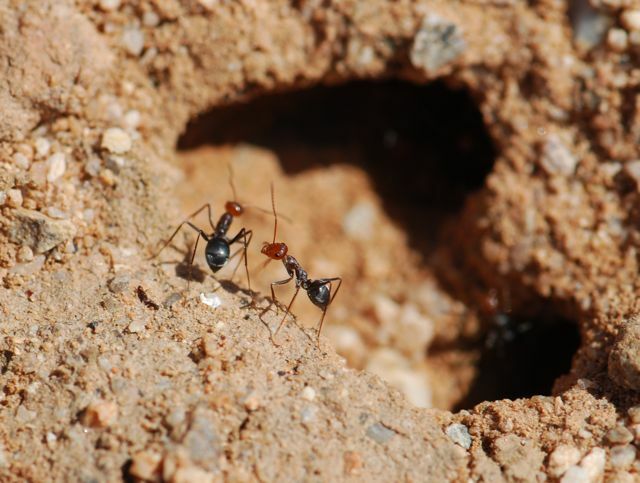 Honeypot ants are the camels of the ant family. They live in dry areas throughout the world where food and water may be scarce for long periods of time. 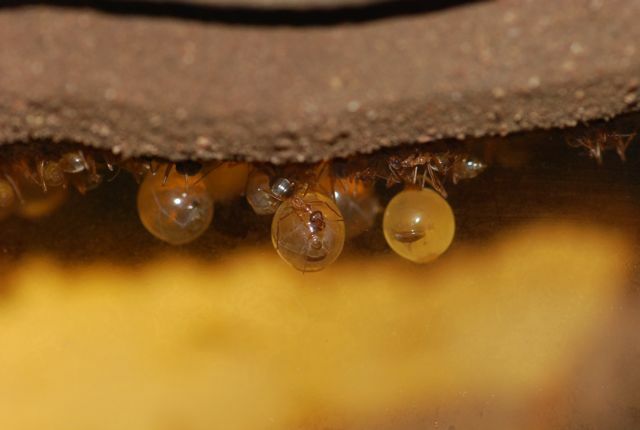 To cope, honeypot ants have unique storage tanks for holding liquids. These storage tanks are special large individual worker ants called repletes. When times are good and food is abundant, the repletes store any extra liquid food that is available and swell up like balloons. Then they hang around, literally, from the ceiling of the nest, until times are tough. If the colony runs out of food, the other workers entice the repletes to spit up their reserves to share with the others. Honeypot ants have deep nests. 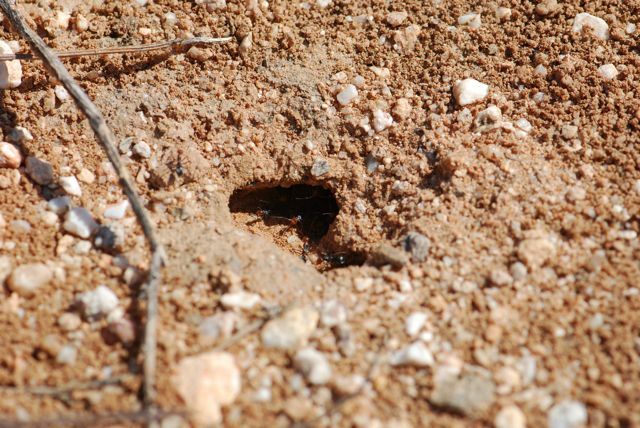 Mammal predators, such as badgers, are known to dig the nests open in search of the repletes. Watching these, I had to wonder about the red heads. Remember the stories about the parasitic nematode that causes an ant’s gaster to swell up like a red berry to make it enticing to birds (see National Geographic’s version)? Looking at those photographs reminded me of a reverse of these ants, which have bright heads instead. Have you ever encountered Myrmecocystus placodops? What do you think of those red heads? 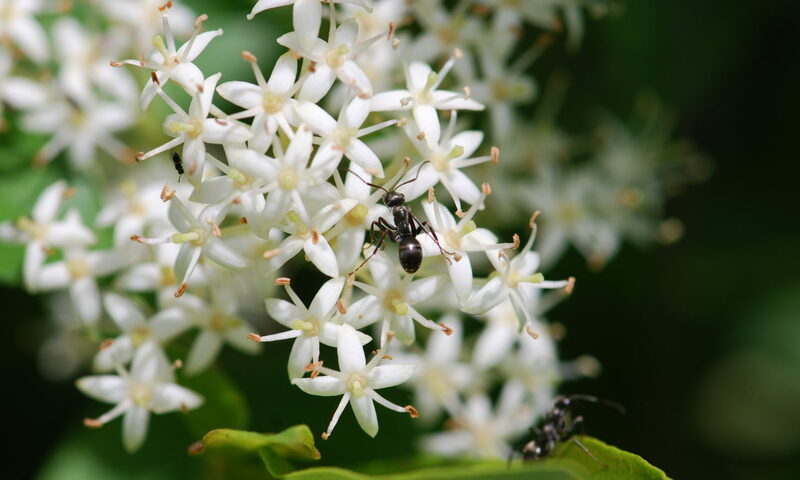 Honey or honey pot ants is a common name of a number of unrelated species with similar habits. Any idea what the yellow grape-like objects are hanging from the nest? The honey ants are the camels of the ant family. They live in dry areas throughout the world, but particularly the deserts of Australia, where food and water may be scarce for long periods of time. 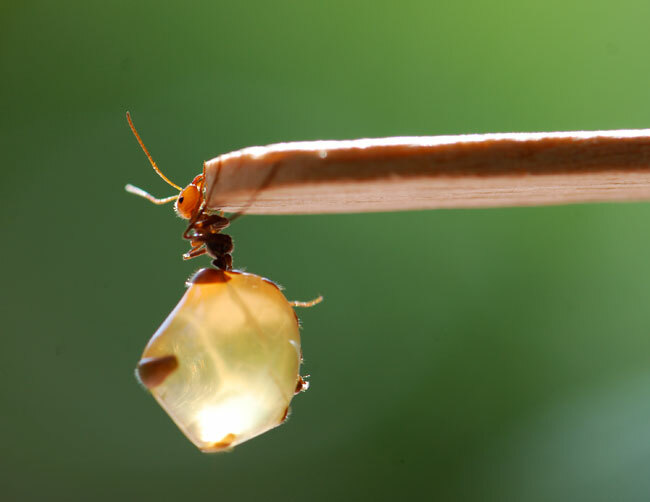 To cope, honey ants have unique storage tanks for holding liquids. These storage tanks are special worker ants called repletes. When times are good and food is abundant, the repletes drink the extra liquid food and swell up like balloons. Then they hang around, literally, from the ceiling of the nest, until times are tough. If the colony runs out of food, the other workers entice the repletes to spit up their reserves to share with the others. Having repletes is kind of like having liquid food in the bank. Because of their name, honey ants are sometimes mistakenly thought to feed on sweets, but the repletes may also store fluid from animal prey. 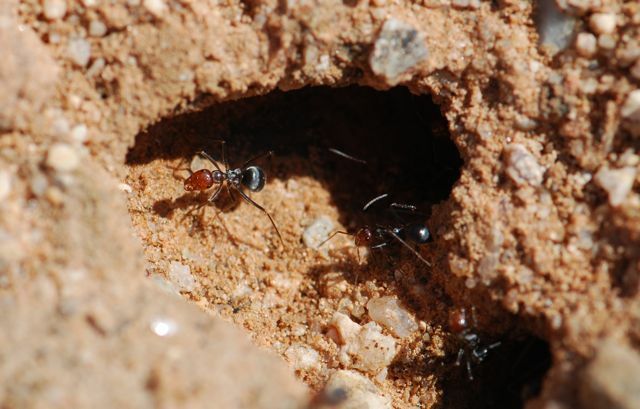 Dr. Bill Brown used to tell a story about how he and some other scientists were digging up a nest of honey pot ants. Having heard that people in the southwestern United States and Australia eat the swollen repletes filled with honeydew, the other scientists decided to taste a few. Dr. Brown declined however, because he had noticed nearby foraging ants were gathering fluids from dead earthworms.